The point of this post is to talk about something I've been doing in all aspects of my life - cleansing my possessions. That probably sounds quite weird but bear with me. It all started with two women coming into the shop I work in; they were talking about a Japanese method of sorting through your wardrobe. I didn't think much of it at the time but I was still eavesdropping (do you know how quiet retail can be after the January sales?) It made me think this is definitely something I need to do. I have two wardrobes so I'm in dire need of a clear out. Later on in the week, I began to think about my belongings and how I've accumulated so much, especially since I went to university. Two rooms merged into one and it was messy business. I had a clear out after I moved back in with my parents but nearly two years later I think I've grasped the importance, or insignificance, of what I own. What motivates me to sort through my things are these questions I keep asking myself. If I were to move out of my parent's house tomorrow, would I take this with me? Would I miss it? If I decided to go travelling for a year, would I think about this? Have I used this? Why is there so much dust?! That's just a little teaser of my mental process as I began this cleanse. 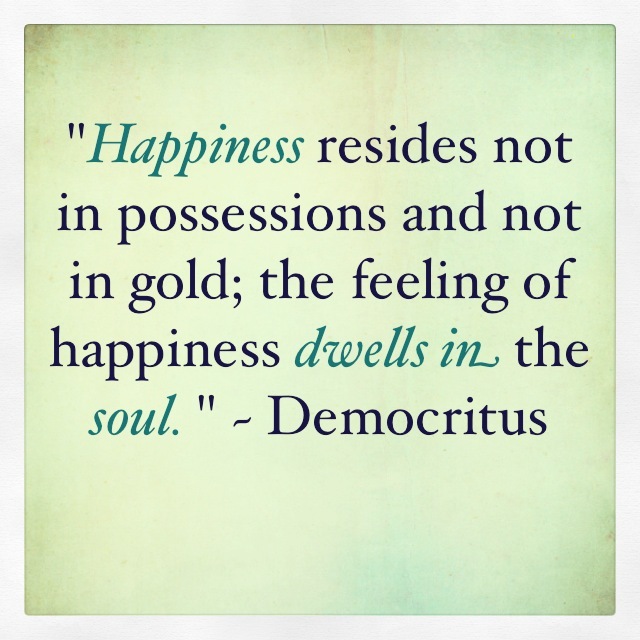 We live in an age where we grow far too attached to possessions. It's incredibly sad that I can look at something I bought, but never used, and ponder for about five minutes whether I want to keep it. To make room for new, fresh things you have to get rid of the old. You don't want to be like one of those people in the programmes about hoarders. FYI: that is my worst nightmare. Sometimes we buy books on a whim. We walk into a bookshop and we get caught up in the smell, the calm and the vast number of shelves. But remember that book you bought that time that you found a complete snorefest? Someone else might enjoy it. I always think this with books. I've read it, did/didn't enjoy it but it's not up there with my favourites, I'm done with it now and maybe someone else will appreciate it far more than me. Remember, even Andy gave his toys away in Toy Story 3. Will you ever read it again e.g childhood book? Right, I had to ask people on Twitter about this. Thank you to those who responded! I used to hoard so many books from my childhood that I haven't read for about 10 or more years. Obviously, some of the books are classics: Harry Potter, Roald Dahl and Enid Blyton. I even kept a few Jacqueline Wilson. I probably halved the amount of books I own and I'm more than happy about that! You have to ask yourself whether you're keeping the book because it has a degree of sentimentality attached to it or if it just brings with it some level of nostalgia, even if you didn't enjoy it. If you didn't wear this item for the whole of 2014 then you probably won't anytime soon. Again, you can donate your clothes and someone else will actually love wearing them. It will make them feel good, and you've helped raise money for charity. But it could always comes in handy I might hear you say, or you haven't had the right occasion: every day brings an occasion. Your wardrobe will thank you for the rejig. I'm starting to come around to the idea of a capsule wardrobe. Watch this space. My style changes all the time. One week/month/year, I turn to the more classic pieces then next week/month/year/full moon I begin to look at something on the complete opposite end of the spectrum. That's fine. As we get older our styles change, as does the way we want to be perceived, and our clothes play a big part in that. Pick out your clothes piece by piece and ask yourself would you buy it now if you saw it in the shops. If not, donate. Have you had it for more time than is specified? I wrote a blog post about this a while ago. Have you seen the label on the back of your products with the little pot with a lid open saying 3m, 12m, 24m? You can see in the photos HERE. When you know where it is, you can't miss it. Well, that stands for the months you should keep the product for. It's a lot less for things like mascara because it's recommended you change it ever 3 months. If you've had your products for years and years then you know it's time for a clear out. Is there a better way of storing it so you'll actually use the products you have? Sometimes the reason I don't use up my beauty products is because I can't see them. For my birthday, my mum and dad bought me lots of MUJI storage. I had the five drawer but my make-up was expanding at an alarming rate so I needed more. 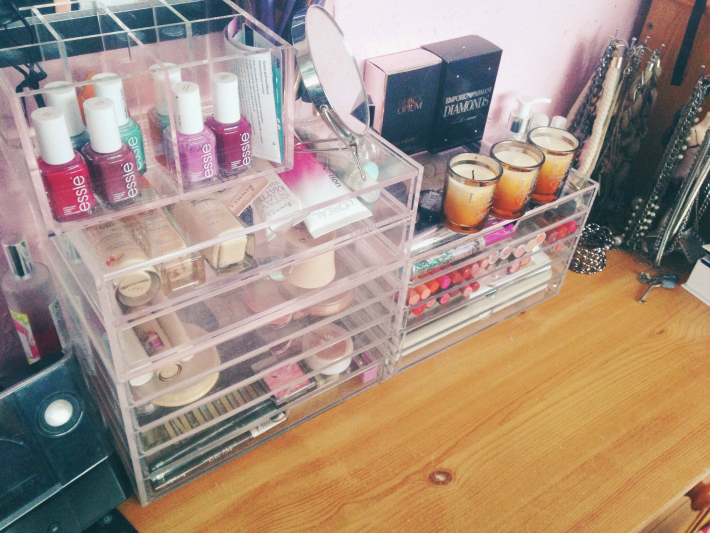 Clear desks are invaluable if you're a bit of a beauty addict. Also, set yourself the target of using your products before you invest in more. I watched a YouTube video from Rosianna Halse Rojas about her Book Cleanse. It resonated with me, particularly the idea of validation. It's based around the idea of validating a perception someone might have of you. Maybe you want to be confirmed as intelligent with a room flooded with books or the fashionable one with wardrobes cluttered with clothes. It's all about associations and the image we're throwing out to the world, and how that penetrates into our personal space. This year I've set a lot of resolutions for myself. And this cleanse is another part of that. I hope this post helped you if you're looking to declutter your life! Let me know anymore tips you have in the comments. I'm in desperate need of sorting all my junk out. I share a tiny flat with my boyfriend and we have stuff everywhere! Hopefully this will inspire me!